By contrast, Conover’s ten-year career in Washington, D.C. prior to joining the Voice of America is virtually forgotten, but during those years he built the connections with jazz musicians, gained the concert promotion experience, and developed the on-air persona which led to his success at the VOA. Understandably, existing research on Conover has focused on his Cold War contributions: Gene Lees devotes a chapter to Conover in his autobiography, but with a brief mention of Conover’s early career;  Terence Ripmaster’s 2007 biography of Conover treats his post-war work before the Voice of America in passing;  Mark Breckenridge’s 2012 dissertation emphasizes the 1960s;  one more extended piece by Ron Fritts, discussing Conover in the 1940s appears in the CD insert of Charlie Parker — Washington D.C., 1948. But there has not been a comprehensive treatment of Conover’s early career. Therefore, this article chronicles that formative decade which set the stage for Music USA and shows how extensively Conover drew upon his own personal resources and relationships to ensure the program’s success. The Willis Conover whom “the rest of the world” came to know first made his mark in Maryland and Washington, D.C.
Peg Lynch and Willis Conover, circa 1940. 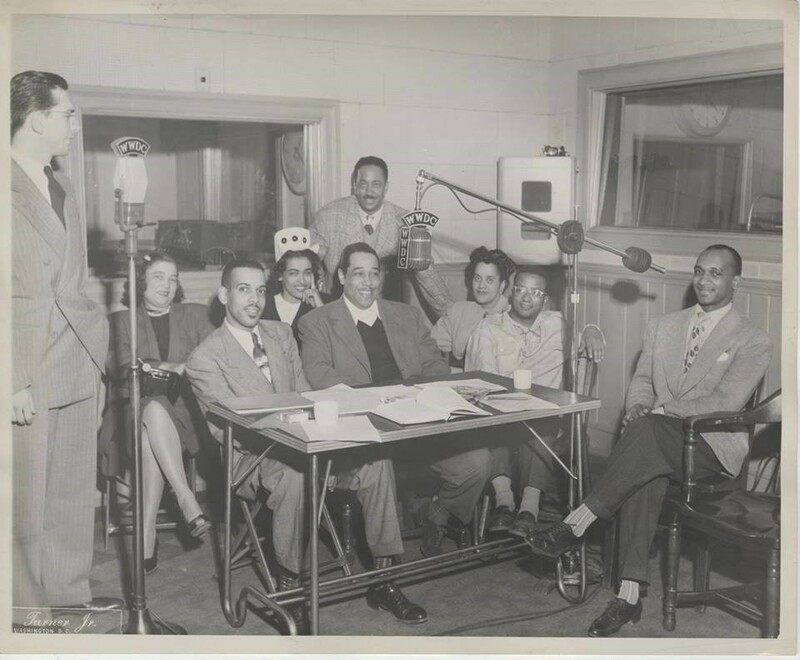 On April 20, 1946, Conover scored a major coup in interviewing Duke Ellington and his entourage in connection with a performance in the area. The recording survives in the Willis Conover Collection at the University of North Texas and in the Ruth Ellington Collection at the Smithsonian Institution, and the tone of the interview is very friendly and humorous, not at all stiff or formal. Weeks later, Conover also featured Lionel Hampton in person,  and on June 6 of that year, Conover emceed Ellington’s appearance at the Watergate Barge, a venue on the Potomac River near the Lincoln Memorial. It was the first time an African-American artist had performed there. When Ellington appeared at New York’s Carnegie Hall in November of 1946, Conover was his emcee. Several selections from that concert were used on V-Discs (742, 750, 759), but with introductions recorded by Leonard Feather on the first two. That same year, Conover leveraged other connections to send his younger sister, Elizabeth, a unique wedding gift, having Nat “King” Cole congratulate the new couple and play a few select tunes dedicated to them on the radio with his trio (that recording also survives at UNT, and is available online),  Conover continued interviewing top names in jazz on WWDC; Stan Kenton, Peggy Lee, and George Shearing are other artists whose appearances survived on broadcast transcriptions at UNT. If I went to see Art Tatum, for example, after he played he couldn’t come and sit with me at the table. He and I would have to go upstairs to his dressing room and talk there. I made a deal with every place where I presented music. I said, “Look: I will not advertise the event in the Afro American newspaper. I’ll be buying ads in The Washington Times Herald, and The Washington Post, and The Washington Star, and so forth, and talking about it on my program, but you, regardless of the law in this town, will admit anyone who is as properly dressed and properly behaved as the rest of the people.” And so they agreed, and my events were the first integrated downtown events. By 1949, Conover was also known to the Voice of America, over six years before the beginning of Music USA. The aforementioned Washington Post article from 1951 notes that “The State Department has used Conover on ‘Voice of America’ broadcasts on American Jazz,”  and a Voice of America broadcast transcription entitled American Jazz #1 survives in the UNT collection. On the recording, dated August 23, 1949, Conover presents a survey of Duke Ellington’s music, reading his comments in English, followed by an unidentified narrator reading a translation in Swedish. Almost immediately following that date, The Washington Post noted on September 4, 1949, that “Willis Conover, WWDC expert on swing and jazz, is on a busman’s holiday. He’s traveling with Duke Ellington’s orchestra during the next two weeks, to add to his knowledge of jazz lore.”  It is possible to pinpoint Ellington’s itinerary during that time. The band began September at the Click Club in Philadelphia, continuing to Buffalo (Conover’s hometown), Toronto and Sudbury, Ontario, and New York City. Regrettably, the online Ellingtonia discography shows a gap between September 4 and 19 for released recordings,  but it is possible to hear the band Conover heard on the Raretone release Live At Click Restaurant Philadelphia 1949, Vol. 4 (5005-FC) and AFRS JJ-83. A central arranger for The Orchestra was Bill Potts, who at age 15 had won a talent contest emceed by Conover and sponsored by WWDC. Potts, a pianist and arranger, went on to become known for the 1959 album The Jazz Soul of Porgy and Bess; in the early 1950s, Potts contributed prolifically to The Orchestra’s library of arrangements, including original compositions such as “Playground” and “Willis.” A 2003 Washington City Paper article aptly characterizes Potts’s work as “bold, textured, polyphonic jazz full of nuance and sly humor.”  “Playground” is a particularly appropriate example, as a prim, baroque-leaning trumpet introduction seamlessly becomes the melody of a medium/up-tempo blues. The Orchestra performed at Club Kavakos and hosted numerous guest stars including Dizzy Gillespie (1955), Bud Powell (1953), and Charlie Parker (1953). Bill Potts had the foresight to record many performances, several of which were commercially released decades later: Charlie Parker: The Washington Concerts; Dizzy Gillespie: One Night in Washington; and Bud Powell’s Inner Fires. While the spotlight was on the guest artists, the recordings also provide evidence of the caliber of the band’s performances. Four tape recordings in Conover’s own collection at the University of North Texas expand the known repertoire of the band and feature vocalists Lea Matthews and Jack Maggio. Further evidence of the depth of Conover’s relationships with jazz musicians resides in Billy Taylor’s “Memories of Spring,” a tune on his 1955 album A Touch of Taylor. Taylor dedicated that tune to Conover, as Bob Altschuler explained on the back of the album cover: “Over the years Billy has received warm encouragement from many of those gentlemen who are customarily identified with microphones and turntables. In this album Billy has tried to answer some of their requests for theme or background music.”  Conover was among that select group, which also included Al “Jazzbo” Collins. 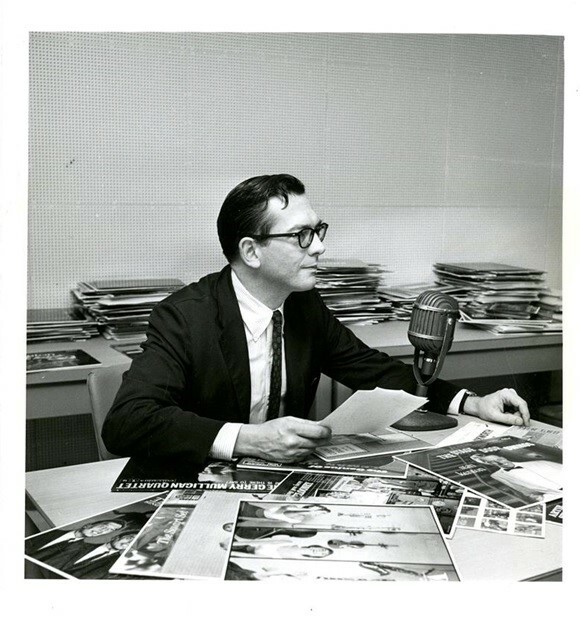 Willis Conover at the Voice of America, circa 1959. The first fourteen months of Music USA programs demonstrate how Conover drew on his unique personal network of access to star power to benefit Voice of America. Most of the guests he interviewed for the Voice of America appeared in concerts he promoted or had appeared on his program on WWDC or WEAM, including Kai Winding  (Music USA #131, and #408, with J.J. Johnson), Art Tatum (#172 and #366), Billy Taylor (#181), George Shearing (#219), Louis Armstrong, Barney Bigard, Bobby Hackett, and Woody Herman (#226), Duke Elllington (#300), Charlie Ventura (#302, with Don Elliott), Peggy Lee (#345), Dizzy Gillespie (#358), Stan Kenton (#373), Bob Thiele (#399, with Steve Allen), Billy Eckstine (#420), and Billie Holiday (#447). An unused interview with Johnny Hodges from around February of 1955, possibly a trial run for Music USA interviews, also survives in the UNT Collection. Had Charlie Parker lived past March 12, 1955, it is quite reasonable to expect he would have been on the schedule as well. It is clear, therefore, that Conover was not trading on the Voice of America name to attract stars to the shows, but rather on his own. This sheds a different light on his status as an independent contractor with the Voice of America. He never transitioned to being a regular employee of the U.S. government. This allowed him to maintain control over the content and quality of his programs and to take on projects outside of the VOA. Music USA would have occurred without Conover under Ray Michael, but it more than likely would have been just another jazz show among the many which occasionally appear and disappear in programming schedules in the U.S. National Archives (with the exception of Leonard Feather’s Jazz Club USA on VOA, which enjoyed a strong run around 1951). A successful program like Conover’s — both musically and diplomatically — required knowledge, enthusiasm, and commitment well above and beyond spinning records. Those attributes made the difference in achieving the goal of forging connections across cultures, as opposed to simply providing long-distance dinner music. Ray Michael and subsequent secondary weekend hosts were fine broadcasters who went on to successful careers in the mid-Atlantic region, but Willis Conover was uniquely suited to take the program to another level. Thankfully, he was afforded the chance to do so. “Aircasters,” Broadcasting, January 8, 1951, accessed August 30, 2016, http://www.americanradiohistory.com/hd2/IDX-Business/Magazines/Archive-BC-IDX/51-OCR/1951-01-08-BC-OCR-Page-0048.pdf. Breckenridge, Mark. “Sounds for Adventurous Listeners”: Willis Conover, the Voice of America, and the International Reception of Avant-garde Jazz in the 1960s. PhD diss., University of North Texas, 2012. “Coast to Coast: District of Columbia,” Radio Daily, November 29, 1946, 8, accessed August 30, 2016, http://www.americanradiohistory.com/hd2/IDX-Business/Magazines/Archive-Radio-Daily-IDX/RD-46/Radio-Daily-1946-Nov-0160.pdf. “Conover Traveling,” Washington Post, September 4, 1949, S10. 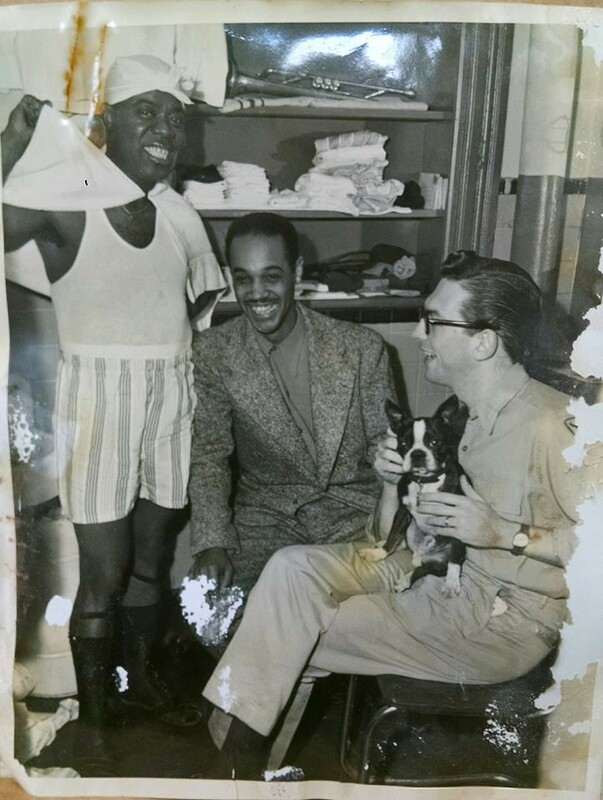 Conover, Willis, interview by Billy Taylor, Smithsonian Jazz Oral History Project, August 16–17. 1994. Conover, Willis, interview by Clifford Groce, The Association for Diplomatic Studies and Training Foreign Affairs Oral History Project Information Series, August 8, 1989, accessed August 29, 2016, http://www.adst.org/OH%20TOCs/Conover,%20Willis.TOC.pdf. Dean, Eddie. “Swing, Or I’ll Kill You,” Washington City Paper, August 8, 2003, accessed August 30, 2016, http://www.washingtoncitypaper.com/news/article/13027274/swing-or-ill-kill-you/. “The Duke Ellington Itinerary,” accessed August 29, 2016, http://www.ellingtonweb.ca/Hostedpages/Carl'sRequestedDoojiWebsiteBackups/1941-1950.pdf. The Duke Ellington Society, Washington Chapter, “Duke’s Washington,” accessed August 30, 2016, http://www.depanorama.net/desociety/DukesWashington.pdf. Ellingtonia, “1941–1951,” accessed August 29, 2016, http://www.ellingtonia.com/discography/1941-1950.html. Fosler-Lussier, Danielle. Music in America’s Cold War Diplomacy. Oakland, CA: University of California Press, 2015. Fritts, Ron. “Charlie Parker at the Washington, D.C. Music Hall,” notes accompanying Charlie Parker — Washington D.C., 1948. Plattsburgh, NY: Uptown Records UPCD 27.55, 2008. Harrington, Richard. “THE Orchestra of Jazz,” Washington Post, December 18, 1983, accessed August 30, 2016, https://www.washingtonpost.com/archive/lifestyle/style/1983/12/18/the-orchestra-of-jazz/065d9a73-39ea-4119-bcb9-043e4856784a/. Investigation of radio and television programs : hearings before a Subcommittee of the Committee on Interstate and Foreign Commerce ... on H. Res. 278, June 3, 4, 5, 26, September 16, 17, 23, 24, 25, 26, December 3, 4, and 5, 1952, accessed August 30, 2016, https://catalog.hathitrust.org/Record/006765311. King, Astrid. “Peg Lynch: Biography,” accessed August 29, 2016, http://www.peglynch.com/biography/. Lees, Gene. 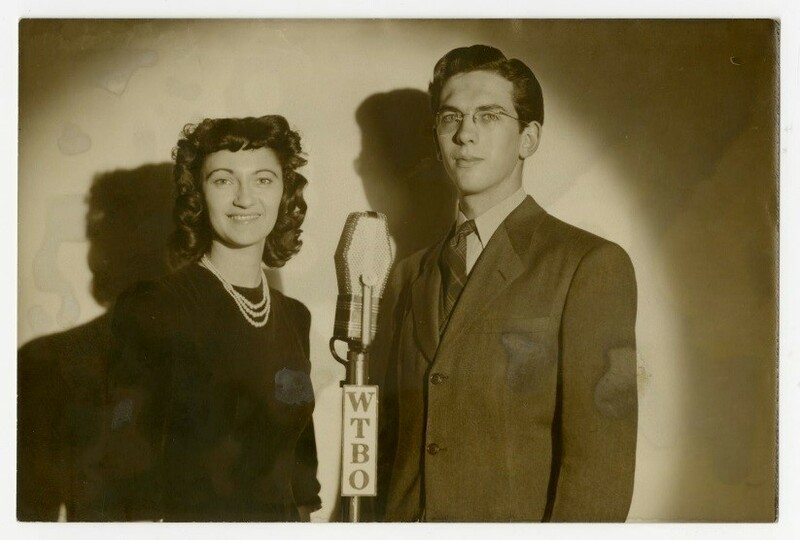 “The Man Who Won the Cold War: Willis Conover,” Friends Along the Way: A Journey Through Jazz. New Haven, CT: Yale University Press, 2003. “‘Morals’ Inquiry: ‘Drys’ Take Offensive as Hearings Begin,” Broadcasting, June 9, 1952, 27, 34, accessed August 30, 2016, http://www.americanradiohistory.com/hd2/IDX-Business/Magazines/Archive-BC-IDX/52-OCR/BC-1952-06-09-OCR-Page-0027.pdf; http://www.americanradiohistory.com/hd2/IDX-Business/Magazines/Archive-BC-IDX/52-OCR/BC-1952-06-09-OCR-Page-0034.pdf. Ripmaster, Terence. Willis Conover: Broadcasting Jazz to the World. Lincoln, NE: iUniverse, 2007. Sager, Mike. “...Merry-Land Fades Into the Night,” Washington Post, June 24, 1979, accessed August 30, 2016, https://www.washingtonpost.com/archive/local/1979/06/24/merry-land-fades-into-the-night/2e55b865-b18d-4766-962f-39f13ae25060/. Stein, Sonia. “The Jockey’s Got to Know His Steed,” Washington Post, January 27, 1951, B11. _____. “That Fatal ‘Slip of a Lip’ Can Sink an Announcer, Too,” Washington Post, March 10, 1946, S8. Taylor, Billy. A Touch of Taylor, Prestige Records PRLP 7001, 1955. Thomas, Robert McG. “Willis Conover Is Dead at 75; Aimed Jazz at the Soviet Bloc,” New York Times, May 19, 1996, accessed August 31, 2016, http://www.nytimes.com/1996/05/19/us/willis-conover-is-dead-at-75-aimed-jazz-at-the-soviet-bloc.html. “Today’s Radio Programs,” Washington Post, March 21, 1946, 13. Von Eschen, Penny. Satchmo Blows Up the World: Jazz Ambassadors Play the Cold War (Cambridge, MA: Harvard University Press, 2006). Weed & Company, advertisement for WWDC, Broadcasting, December 24, 1945, accessed August 29, 2016, http://www.americanradiohistory.com/hd2/IDX-Business/Magazines/Archive-BC-IDX/45-OCR/1945-12-24-BC-OCR-Page-0010.pdf. Williamson, Georganne. “On the Town,” Washington Post, October 26, 1949, B13. “Willis and Art Make Record,” Washington Post, December 17, 1950, L4. Willis Conover’s House of Sounds, Brunswick BL54003, 1953. Robert McG. Thomas, “Willis Conover Is Dead at 75; Aimed Jazz at the Soviet Bloc,” New York Times, May 19, 1996, accessed August 31, 2016, http://www.nytimes.com/1996/05/19/us/willis-conover-is-dead-at-75-aimed-jazz-at-the-soviet-bloc.html. Penny Von Eschen, Satchmo Blows Up the World: Jazz Ambassadors Play the Cold War (Cambridge, MA: Harvard University Press, 2006), 14. Danielle Fosler-Lussier, Music in America’s Cold War Diplomacy (Oakland, CA: University of California Press, 2015), 85–86. Gene Lees, “The Man Who Won the Cold War: Willis Conover,” Friends Along the Way: A Journey Through Jazz (New Haven, CT: Yale University Press, 2003), 250–267. Terence Ripmaster, Willis Conover: Broadcasting Jazz to the World (Lincoln, NE: iUniverse, 2007). Mark Breckenridge, “Sounds for Adventurous Listeners”: Willis Conover, the Voice of America, and the International Reception of Avant-garde Jazz in the 1960s, (PhD diss., University of North Texas, 2012). Ron Fritts, “Charlie Parker at the Washington, D.C. Music Hall,” notes accompanying Charlie Parker — Washington D.C., 1948, (Plattsburgh, NY: Uptown Records UPCD 27.55, 2008), 2–25. Willis Conover, interview by Billy Taylor, Smithsonian Jazz Oral History Project, August 16–17. 1994. Astrid King, “Peg Lynch: Biography,” accessed August 29, 2016, http://www.peglynch.com/biography/. Willis Conover Collection, University of North Texas Music Library, Series 2, Sub-Series 4, Box 3, Item 13. Sonia Stein, “That Fatal ‘Slip of a Lip’ Can Sink an Announcer, Too,” Washington Post, March 10, 1946, S8. Willis Conover Collection, University of North Texas Music Library, Series 2, Sub-Series 4, Box 1, Item 8. Willis Conover Collection, University of North Texas Music Library, Series 2, Sub-Series 4, Box 1, Item 10; online at http://digital.library.unt.edu/ark:/67531/metadc861621/. Sonia Stein, “The Jockey’s Got to Know His Steed,” Washington Post, January 27, 1951, B11. Mike Sager, “...Merry-Land Fades Into the Night,” Washington Post, June 24, 1979, accessed August 30, 2016, https://www.washingtonpost.com/archive/local/1979/06/24/merry-land-fades-into-the-night/2e55b865-b18d-4766-962f-39f13ae25060/. Georganne Williamson, “On the Town,” Washington Post, October 26, 1949, B13. Richard Harrington, “THE Orchestra of Jazz,” Washington Post, December 18, 1983, accessed August 30, 2016, https://www.washingtonpost.com/archive/lifestyle/style/1983/12/18/the-orchestra-of-jazz/065d9a73-39ea-4119-bcb9-043e4856784a/. Eddie Dean, “Swing, Or I’ll Kill You,” Washington City Paper, August 8, 2003, accessed August 30, 2016, http://www.washingtoncitypaper.com/news/article/13027274/swing-or-ill-kill-you/. Willis Conover, interview by Clifford Groce, The Association for Diplomatic Studies and Training Foreign Affairs Oral History Project Information Series, August 8, 1989, accessed August 29, 2016, http://www.adst.org/OH%20TOCs/Conover,%20Willis.TOC.pdf. Billy Taylor, A Touch of Taylor, Prestige Records PRLP 7001, 1955. Willis Conover Collection, University of North Texas Music Library, Series 1, Sub-Series 1, Boxes 1–10, 14. Many of the early interviews may be found online at: http://digital.library.unt.edu/explore/collections/MLCC/browse/?fq=dc_type%3Asound. Maristella Feustle is the Music Special Collections Librarian at the University of North Texas, and oversees the processing and curation of over 100 special collections in the UNT Music Library. She is the current chair of the Preservation Committee of the Music Library Association and is active as a jazz guitarist in the Dallas-Fort Worth area. This article examines the portion of the noted radio broadcaster Willis Conover’s career in the 1940s and 1950s when he was active in the Washington, D.C. and Maryland area. His later international successes with the Voice of America are shown to have resulted from earlier local work. Chicago 15th ed. : Feustle, Maristella. “Willis Conover’s Washington.” Current Research in Jazz 8, (2016).